The Youth WorkNet project is currently in its final stage. 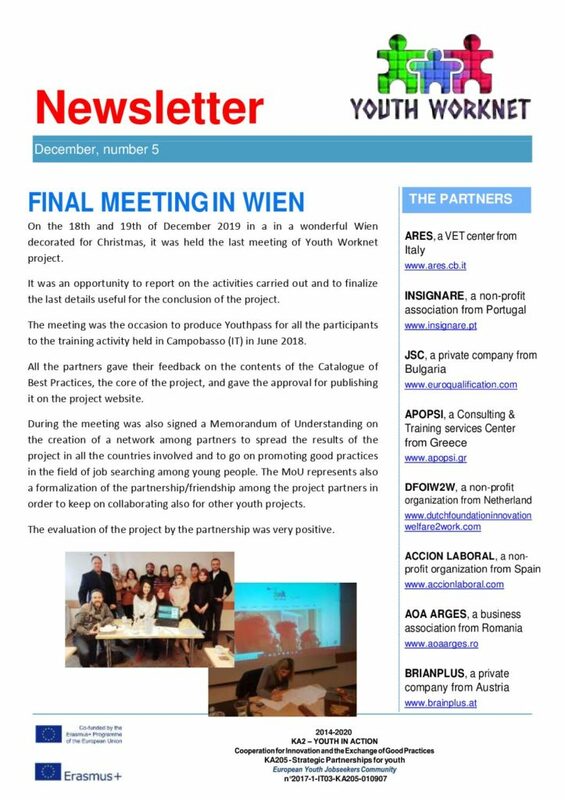 Last year, on the 18th and 19th of December 2018 we had a wonderful meeting in Vienna. It was an opportunity to report on the activities carried out and to finalize the last details useful for the conclusion of the project, with a signed Memorandum of Understanding as highlight of the meeting! The meeting in Vienna was also the right the occasion to produce and finalise the Youthpasses for all the participants to the training activity held in Campobasso (IT) in June 2018. All the partners gave their feedback on the contents of the Catalogue of Best Practices, the core of the project, and gave the approval for publishing it on the project website. During the Vienna meeting the partners also signed a Memorandum of Understanding on the creation of a network among partners to spread the results of the project in all the countries involved and to go on promoting good practices in the field of job searching among young people. The MoU represents also a formalization of the partnership/friendship among the project partners in order to keep on collaborating also for other youth projects.